Tickets are now available….don’t wait! Space is limited. This Mother's Day, we're thanking all of our favorite moms by hosting a Mother's Day Brunch! Featuring an amazing menu (TBA) by our friends at Nobel House of Geneva, the moms in your life are sure to feel the love on their special day. We'll post the menu items online once they've been finalized. We'll also be featuring Alan's beermosas! These drinks will be available while supplies last. The brunch will run from 11am to 2pm on Sunday May 12, and we will be closed to the general public for the duration of the event. Adult tickets are $37 and include brunch and one drink (beer, wine, or beermosa). Tickets for persons under the age of 21 are $25. Kids three and under can brunch with us for free per paying adult. Our first month's gathering had a great turnout and everyone had a ton of fun. Share this event with all your artsy (or not so artsy) friends, because the more the merrier. Plank Road Tap Room is proud to welcome back our friend Dave Oberg, Executive Director of the Elmhurst History Museum, for a special lecture: Beer in the New World! In this two-segment lecture (each part about 20 minutes in length), Dave will guide you through beer's long history here in the New World. Starting with indigenous Native Americans, through the dark era of Prohibition, and the rise of modern craft beer, this lecture will both educate and entertain. Tickets are $10 and include one beer with purchase. Biography: Dave Oberg is the Executive Director of the Elmhurst History Museum and possess a B.A. in History and Political Science from Rockford University and an M.A. in History, with a focus in Historical Administration from Northern Illinois University. He has worked for 29 years in the museum industry and is the author of two books about local history and numerous articles. He is also a homebrewer, craft beer enthusiast and member of the Elmhurst Craft Beer Fest planning committee. You’ve asked. We’re finally getting around to answering. We have a limited number of spots open for our Worst Kept Secret Society! On Saturday, October 6th, from noon to 3pm, we’ll be hosting an open enrollment party. While spots last, you’ll be able to come in and sign up for our members’ club. A brand new numbered member's glass! That's right...it's time to retire the old design. We'll announce the new design soon, but believe us...it's pretty stellar. 10% off all merch (starting Oct 6)! AND A MYSTERY BENEFIT that will be announced when you enroll. You’re welcome to come early to help guarantee a spot. We’ll hand out tickets as people show up to confirm your spot. Note that NO outside beverages are allowed outside before we open, so no bottlesharing, Bloody Mary’s, or other types of non-PRTR-sanctioned drinks allowed. PRTR. Paddy Long’s/Kaiser Tiger. 3 Floyds. Tickets are on sale now for our Saturday, Sept 15 Beer and Bacon Pairing Event. Come and get them, they will move fast. - A good time to be had by all, as anyone who's attended one of our pairing events can tell you. Reception starts at 6pm with the pairings starting at 7pm sharp. NOTE: 21–and-over. No kiddos or pups. Dates, times, menu, and tap list are all subject to change. Join us for the July edition of Beer Choir! The NW Chicago Suburbs Chapter will be kicking things off around 1pm. Join in or sit back and enjoy some fun drinking songs while you drink outside. Grab your old man or hubby by the arm and drag him out of the house for our Father's Day Brunch with Nobel House of Geneva. Tickets are very limited, so grab them while you can. Each ticket includes access to a fantastic brunch buffet by the crew at Nobel House, your first drink (beer, wine, cider or a house-made cold brew coffee), and a special place in Dad's heart. This is your chance to become his favorite child. This is a child-friendly event, so feel free to bring the kiddos along. NOTES: No outside beverages or coolers allowed. 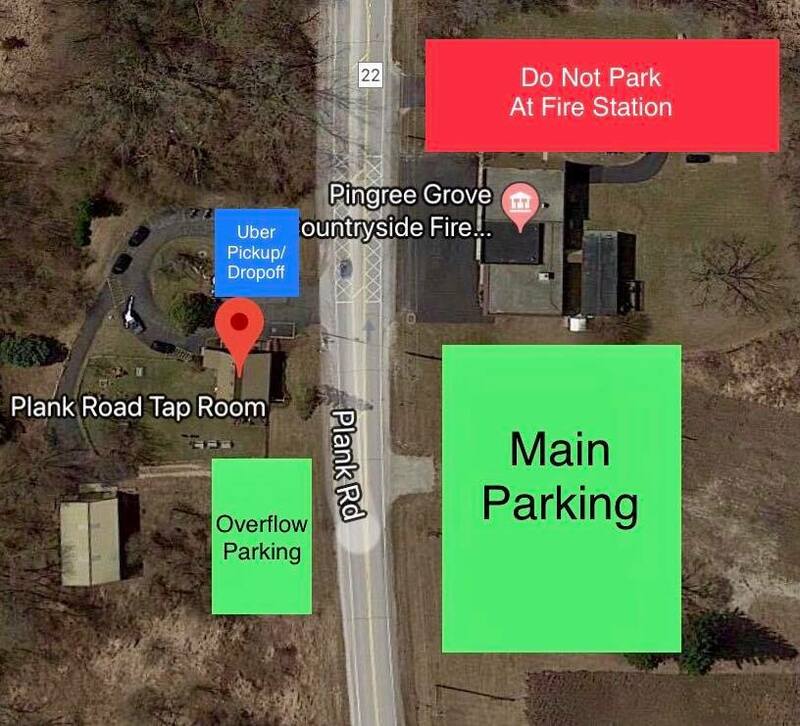 Parking may be limited and is for tap room guests only. All dates and times subject to change. This event has officially sold out! The brunch will run from 11am to 2pm on Sunday May 13, and we will be closed to the general public for the duration of the event. Adult tickets are $37 and include brunch and one drink (beer, wine, or beermosa). Tickets for persons under the age of 21 are $25. Kids three and under can brunch with us for free. Grab tickets while you can, they are extremely limited and will be gone quickly. Join us every Tuesday night and try some spectular cheeses from around the midwest! We've partnered with Great American Cheese of Chicago to bring you cheese flights full of flavor and perfect for pairing with beers from our rotating tap list. Buy two beers (or glasses of wine, if your prefer) and choose one of our two cheese flights to go with it! You'll get three different cheeses and some crackers to pair with your beers, all while saving $2.00 on the cheese flight. Stop back each week to try different cheese flights...we'll rotate them as much as possible. Grab some friends or make it a date night! Join us at the original Elgin area taproom every Tuesday night and try some spectular cheeses from around the midwest! Plank Road Tap Room in Elgin will be closed to the public on Thursday, March 15, for our sold out private doughnut and beer pairing event with Solemn Oath and Herb's Bakery. We will re-open to the public at 12:00pm on Friday, March 16th. See you then! Join us every Tuesday nights and try some spectular cheeses from around the midwest!